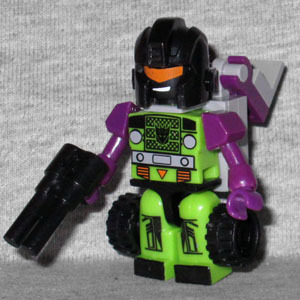 Series 2 of the blindpacked Kre-O Micro-Changers may not have ever made it to stores, but that's okay: Series 3 is the one that has the last Constructicon needed to finish the hexinity. The bowdlerized biographies the early releases had are no more, leaving Kre-O Long Haul without a definite personality. But if he takes after his old counterpart, he hates his job - carrying things around for everybody else - and can be tricked into fights that are way beyond his level. On the plus side, Hasbro's finally moved beyond the "vest" pieces as a way to attach things to the Kreons' backs, which means that the complicated tampograph on the figure's chest (designed to look like the headlights, grill and bumper of a heavy duty truck, just like you would have seen on the chest of the G1 toy. His legs are painted to look like the stickers that were on the front of that toy's legs - ditto the pattern just above his waist. He's armed with a a double-barreled gun. His face is black with an orange visor and a small white mouth. There's a piece of kibble that the instructions show sticking up above his head, but anyone who knows Long Haul knows it should really be folded down. The vehicle mode is lacking, due to the limits of the Kre-O style. Long Haul's design involved a long-nosed truck with a small cab off to one side and a protective "roof" that was meant to be part of the truck bed. This one has a giant, flat cab, and that's it. It's not as far off the mark as Hook's vehicle mode, but it could have been better. One thing it does have going for it? The bed of the truck is mounted on a hinge, so it can actually raise up as if to dump something. That's pretty neat. Long Haul isn't a great Micro-Changer, but add him to the rest of the Devastator crew and he looks better. That's the power of teamwork! This entry was posted in blog exclusive review, Hasbro and tagged Kre-O, Transformers. Bookmark the permalink.